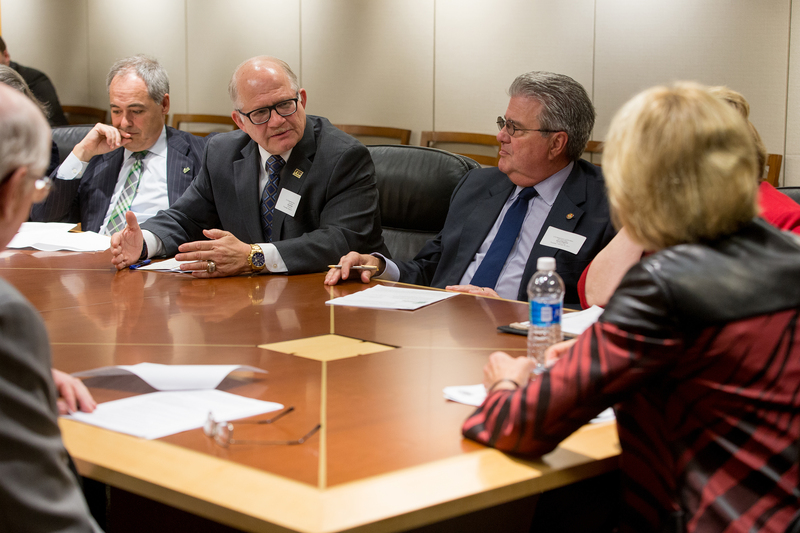 FIU President Mark B. Rosenberg joined 10 other public university presidents and Peter McPherson of the Association of Public and Land-grant Universities (APLU) for an informal conversation with U.S. Secretary of Education Betsy DeVos on Feb. 23, 2017, in Washington, D.C. The meeting explored issues and opportunities that the department and public universities can address through deepened collaboration. The exchange between the secretary and the presidents also touched upon topics ranging from freedom of speech to Deferred Action for Childhood Arrivals. Summer Pell, the value and cost of a college degree, state support for higher education and deregulation were also discussed. Rosenberg specifically addressed the role of education in job creation and employability, the importance of internships, and heightened K-12 collaboration with public universities. Further information on the meeting can be found here.